Welcome to Angels ... the home of Dazzling Evening Wear, Exquisite Wedding & Bridesmaid Dresses, Mother of the Bride & Groom, Gorgeous Debutante Ball Gowns and Glamorous School Formal Dresses! Angels dresses range from size 2 to 26 and can be made to order in any colour. 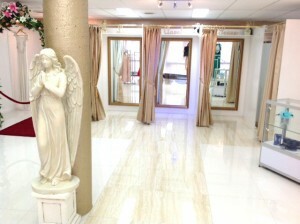 Finding your perfect dress at Angels will be a pleasurable experience with their exceptionally friendly customer service!